Need roof repairs, maintenance or other services? Our friendly staff will stop by your property for an evaluation a.s.a.p. Call us at (702) 251-ROOF to schedule or click here to . . .
"You Have Called The Rest, Now Call The Best!" 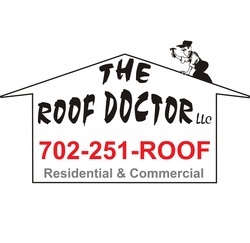 The Roof Doctor LLC is a licensed residential and commercial roofing contractor in Las Vegas, Nevada, also serving Henderson, Boulder City, North Las Vegas, Laughlin and other surrounding areas The Roof Doctor is locally owned and operated by Rich Blunk and Staci Blunk and has been serving the valley for more than 20 years. Rich Blunk has served in the roofing and construction industry since 1989. Rich and Staci have taken their passion for customer service and superb roofing experience and opened The Roof Doctor, LLC with a staff and crew that can conquer any size project. Rich Blunk has extensive experience in Life Deck Coating Systems as well as all types of waterproofing systems. The Roof Doctor does all types of roofing and waterproofing from Standing Seam, Single Ply, and Built up Roofing, Wood Shake Conversions, and Concrete Tile & Torch Down to Elastomeric Coat Roof Systems. We can do Residential and Commercial roofing projects, from the smallest repair for a homeowner to the largest retail facility construction for a builder; we do it all. Please call our office at 702-251-7663 and talk to our friendly staff about your next project, or to get an estimate. We look forward to working with you in the near future. "After the high gusts we had, we checked our roof and saw that we had a a few broken tile. We e-mailed in a picture and got an estimate sent by email. The work was scheduled, Rich showed up, assessed the situation, went and got the materials and a short while later was all finished. No problems and we would recommend him and we would not hesitate to use them again. We appreciated that the owner did the work himself. Thanks."